This is the second section of our guide to calculating player value in fantasy football. Each part will lay out a different aspect of the process. Part I is already up, and Parts III, IV, and V will be published on our blog throughout the week. For those with drafts this week, you can find a preliminary auction values chart at the end of this article. Welcome to Part II of HSAC’s Fantasy Value Handbook. When I left you in Part I, I had declared my intentions to create a new system for assessing player value in fantasy football. 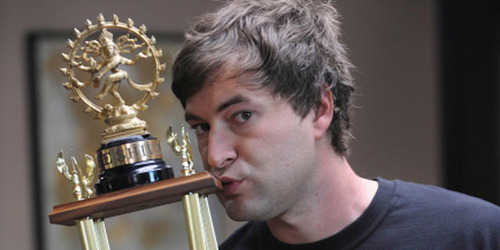 I started by explaining why the objective-weekly approach can help you more accurately value players and ultimately hoist your fantasy league’s championship trophy in January. Now, in the second part of our series, I am going to lay out the first steps in creating this new system. We ultimately want to project the value of each draft pick in 2013 using the actual values of each draft pick from 2008 to 2012. Before we can do that though, we have to figure out how valuable each player actually was over those last five years. This particular section is dedicated to making that calculation. This is how we measure the value of every player in each week. Once we have all of these values for each player season from 2008 to 2012, we can just sum them up to get every player’s total seasonal value. And after we have the seasonal value calculations, we can move onto using them in our projections for 2013. So far, it sounds like all we have to do is a little addition and subtraction before we have the value of every past player. Unfortunately, the one thing I left out above is actually calculating replacement level, and we have some work ahead of us in order to accomplish that. We’ll start with the first and simplest step, checking your league’s settings to see how many players you have to start at each position. We’ll use a standard ten-team league as an example. Each team starts 1 QB, 5 FLEX (RB/WR), 1 TE, 1 DEF, and 1 K, so between ten teams the whole league starts 10 QB’s, 50 FLEX’s, 10 TE’s, 10 DEF’s, and 10 K’s. If you are in a competitive league where everyone pays attention (we’ll get to how this changes things later), approximately the ten best QB’s, fifty best FLEX’s, ten best TE’s (and so on) will start. This lowest ranked starter at each position is our weekly replacement level. It was easy to find the positional ranking of the replacement level player, but now we need to figure out how many points he is expected to score. Thanks to ESPN’s archives, we can do this by using their weekly consensus rankings from the past five years to predict actual fantasy points. For each position, we’ll fit a regression model to the data that projects an expected fantasy point total given a player’s ranking that week. If we want to know how many points the replacement level player is expected to score, we just plug his ranking into the model. Before I show you the replacement levels that this process generates, I’ll go through and explain the key takeaways and results of each positional model, moving from the position with the most predictable performance to the ones with the least. That means that we start with running backs. 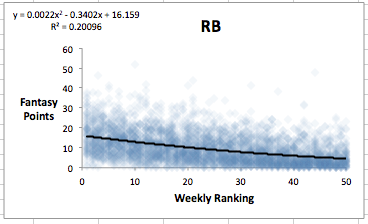 The best fit for weekly performance at running back, like performance at all other positions, is a quadratic model. This means that the expected difference in performance between two players decreases as rank goes up. In other words, there’s a bigger difference between Adrian Peterson and the number two running back than there is between the number twenty-nine and the number thirty running back. 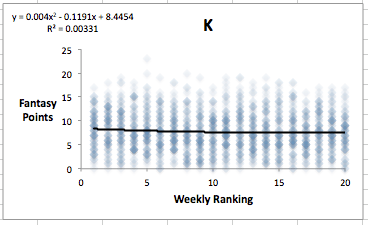 When we want to know the expected performance of any player specifically, we can just plug their rank into the model. If our replacement level running back is ranked twenty-seven, for example, the model tells us that his expected performance, based on similar players over the last five years, is 8.6 points. But we don’t just want to know the expected level of performance at each position; we also want to know about the amount of variation in that performance. The r-squared value for running backs is 0.2, which means that 20% of the variation in fantasy points for a player in a given week can be explained by their rank. This is a higher r-squared value than any other position. A higher r-squared value means the experts found the position more predictable, so either running backs are easier to forecast or the experts just allocate more of their time to running back analysis. Let’s take a look at the next two most predictable positions, quarterback and tight end. With an r-squared value of .07, wide receivers are still closer in predictability to quarterbacks and running backs than they are to the more volatile defenses and kickers. 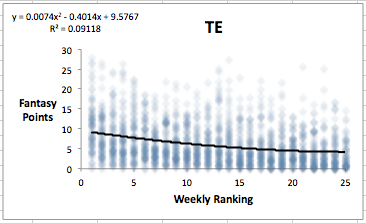 However, the wide receivers are more similar to the kickers in that their curve is pretty flat; the model doesn’t predict much better performances for highly ranked receivers than it does for lower ranked ones. 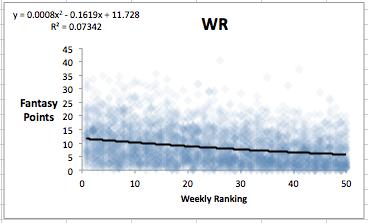 On a seasonal basis, wide receivers do get more of a chance to establish themselves, but with the small-sample size randomness of a single game at play, weekly performances at this position differ less than you think between the A.J Green’s and Anquan Boldin’s of the world. Where wide receivers are pretty similar but at least a little predictable, kickers and defenses accomplish neither. With r-squared values of .03 and .003, defense and kicker performance appears close to random. To be fair, defensive performances are a little more patterned and a little more differentiated, but still don’t stack up against the other positions. 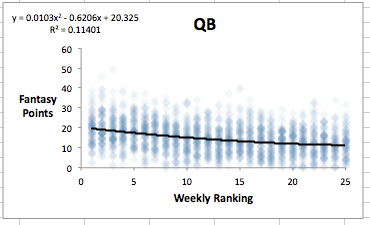 Kickers, meanwhile, are in a different stratosphere than the other positions in terms of randomness. There is basically no relationship here between rankings and fantasy points. If you’re agonizing over whether to start Stephen Gostowski or Matt Bryant in Week 1, just flip a coin. Out-of-nowhere players are guys who had fluky performances that no fantasy owners started. In real life, these players didn’t actually help any fantasy teams, so we need to value them in a way that accounts for this. Whether the Texans third-string tight end scored zero points or fifty, no one owned him, so assigning him a no-value-added PAR of zero is appropriate. While discrediting fluky performances, PAR actually boosts the value of injured or bye week players. If we didn’t automatically assign them a zero, inactive players would get credited with negative PAR, because they didn’t play. But if you knew they weren’t playing, you got to start someone in their place, a replacement player. So on average, you’ll get replacement level points when your guy gets hurt or is on bye, making zero PAR, rather than negative PAR, an accurate description of your hobbled would-be starter’s value. Are you able to share your list of players that go along with your data results? i.e. Where you specifically say which players should be drafted where? Tonight is pretty much the last night we can use this information due to the season starting tomorrow night, so tonight’s drafters could benefit greatly if you were to post your rankings. Shouldn’t replacement level be based on the highest ranked player available, not the highest ranked non-starter? While 50 flex players may play each week, I do not have the option of replacing my bye week player with #51. It’s more likely to be #111. Free agency isn’t your only option for replacing a player though- you also have your bench and the trade market at your disposal. In a truly efficient league where no value is being wasted (I know that people don’t usually trade aggressively enough to make this happen), the fiftieth flex player would be the true replacement player. In a league with a slower trade market, it’s probably a little lower. One wrinkle that I’ll talk about later though is that owner skill and activity level results in different replacement levels for different owners. For example, if you are an active, skilled owner, your personal replacement level rises- even if the league average replacement level is 50 flexes, your personal replacement could be 45 flexes. I went with 50 as an approximation, but it’s really more of a fluid thing because of the individual variation.